I'm curious. If you had to limit yourself, from here to eternity, with only three lenses that you currently own, what would they be? SMC Pentax DA 16-45mm. This would cover all my "wide angle" shots up to and including most "normal angle" work. I wish I had something a little wider, but alas.... this is it. SMC Pentax FA 100mm f:2.8 Macro. I simply CANNOT imagine NOT having a true 1:1 macro lens available! I have a FA 50mm f:2.8 Macro, but I like the longer minimum focusing distance of the 100mm. Easier on the old, worn out back! It would also serve as a good portrait lens, albeit a little too sharp for most occasions. But, that could be remedied in PP. SMC Pentax DA 55-300mm. This would cover everything from "normal angle" to most of my "telephoto" needs. It would be a toss-up between my Sigma 70-300mm, but.... yeah, the Pentax would win out. I wish I could say I own a Sigma 50-500mm Bigma, but that's only in my dreams! I have several other lenses that I'd hate to leave behind.... but, if I HAD to stay within the parameters set, these would be the three I'd take along. Re: Your "Three Lens Kit." A gorgeous collection of wonderful old glass! Unequaled quality of build. TFS. 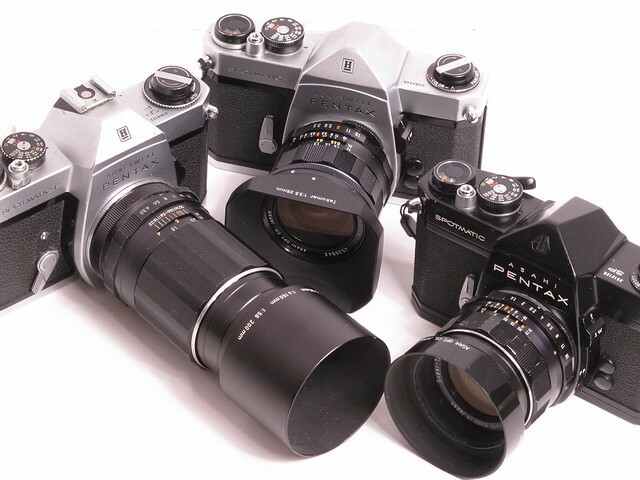 I began my journey in photography half a century ago with a Spotmatic and the 35mm f:3.5, 50mm f:1.4, 105mm f:2.8 and the 135mm f:3.5. It looks like most of us picked basically the same focal length lenses..... something to cover just about any situation that might pop up.